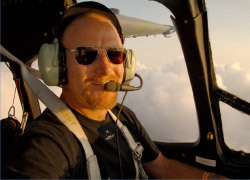 With the release of FRONT ROW CENTER 3, his sixth book, Erik Hildebrandt is firmly established as one of the most resourceful and innovative creators of world-class aviation imagery. Far more than simply pictures of planes, Erik’s photographs are an illustrious combination of natural light, atmospheric conditions and of course aircraft. His knowledge of each platform, passion for flight and attention to safety affords Erik the trust and respect of his subject aviators that is critical to capturing such magical moments as this book is comprised. The success of the images within this volume reflect that trust and are evidence of Erik’s tremendous appreciation for the opportunities to work with such highly skilled pilots as these.